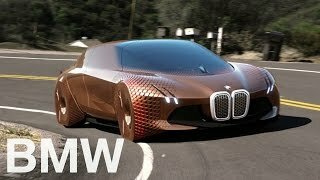 If the BMW Vision Next 100 concept car is a glimpse of the future, then we like what we’re seeing. 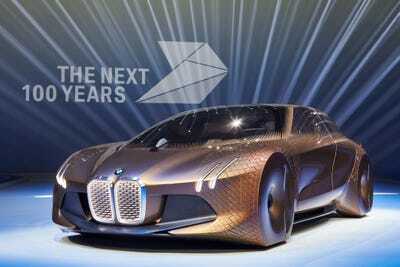 The Vision Next 100 was first unveiled at the Geneva Motor Show in March, but BMW has been adding cars to its line that is celebrating the automaker’s 100th birthday. Each car is meant to give a taste of what we can expect in the next 100 years. 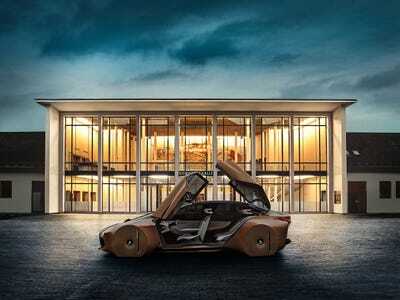 Here’s a closer look at the BMW Vision Next 100. The BMW Vision Next 100 has two different driving modes. Boost Mode is for classic, manual driving, but Ease Mode will make it a self-driving car. If you go with Boost Mode, a heads-up display will show the ideal route on the windshield, and other notifications like oncoming vehicles. But if you click into Ease Mode, that heads-up display will show content you want to see like your email, and the steering wheel will retract. The car also comes with an artificial intelligence system dubbed Companion that can learn your driving preferences to set them up in advance. It can even signal for pedestrians to cross when in autonomous mode. The fabric in the car is made from recycled materials. And some parts of the car, like the side panels, are made out of carbon fibre. Perhaps our favourite feature are the wheels that make this beautiful, sleek movement with the rest of the car when the steering wheel is turned. You can learn more about the Vision Next 100 concept car here.